Photograph of the Battis Khambha at Agra, from the Archaeological Survey of India, taken by Edmund William Smith in 1893-94, from the Archaeological Survey of India. The Battis Khambha, a pavilion with an octagonal cupola is composed of red sandstone and supported by 36 pillars, is located in the Ram Bagh gardens. 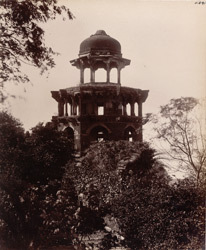 View of the octagonal tower, near the Rambagh, on the east bank of the Jumna from the north-east. "The Battis Khambha (Plate II) [this image] is a tower rising from the sands of the Jumna five stories in height surrounded by arched galleries. On the fourth story of this building are twenty-four columns and crowning it and forming the fifth story is a cupola supported on eight slender shafts. Next to the Bhattis Khamba is the Ram Bagh, more properly called Aram Bagh, the "garden of rest;"...a large walled garden with a raised stone terrace on the riverside."